What follow s is a letter I wrote to BuzzFeed staff regarding a post by Gabriel Sanchez about Edward S. Curtis’ photographs. I was compelled to write directly to Ben Smith (Editor in Chief), Doree Shafrir (Executive Editor) and Sanchez himself (Photo Essay Editor) after having seen no action taken to adjust the racist and inaccurate language used in the piece. I previously tweeted and commented about the post, but received no response. BuzzFeed gets 200 million unique viewers every month, so their position to influence and educate people is significant. Hello. My name is Madeline Knickerbocker, and I am a PhD candidate in the Department of History at Simon Fraser University in British Columbia. Among other things, my research looks at the political nature of Indigenous cultural heritage. I am writing regarding your post on Edward S. Curtis’ photography, and my deep concerns for its inaccurate treatment of the Curtis images, which perpetuates the racist ideologies Curtis himself sought to prop up with his work. I am not alone in my frustrations with the post. Many commenters, including numerous people who identify as Indigenous, have explained why the language used is problematic. I have previously tweeted my concerns to Mr. Sanchez and to @BuzzFeed, and also commented on the post itself. Other than Mr. Sanchez “favouriting” my tweets, I have seen no response on this issue. Although initially it seems your staff took these comments seriously and made a minor alteration, the piece remains very flawed. I do credit you for making the early correction and wonder why you did not continue to adapt the language in the piece to better reflect not only the actual history involved, but also the concerns raised by your readers. 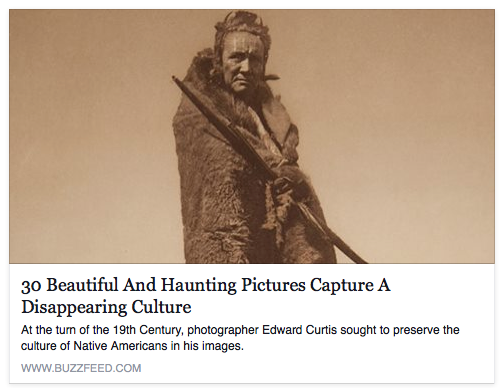 I note that Mr. Sanchez is a photo editor, and so I understand the decision to share these photos likely came from a position of aesthetic appreciation, and not a desire on the part of either Mr. Sanchez specifically or BuzzFeed more generally to affirm the racial hierarchies that were the foundations of the Curtis’ work. However, despite the messages from numerous individuals, Indigenous and non-Indigenous, explaining the problems with Mr. Sanchez’s commentary, there has been no further effort to ameliorate the article. Things go wrong in the title. The phrase “A Disappearing Culture” is inaccurate for two reasons. First, there is no one, single, Indigenous culture. Even Curtis knew that. Your use of the article “a” here, however, completely ignores the diversity of Indigenous cultures that exist, have existed, and will continue to exist across North America. This is a problem because it allows your readers to continue to uphold stereotypical ideas of Native Americans: for instance, that Native culture can be summed up in feathered headdresses, war whoops, buckskin, and teepees. The second issue with the title is one that pervades the whole piece. The word “disappearing” is, by any objective measure, wrong. In fact, all of the communities represented in the Curtis pictures Mr. Sanchez featured in the post still exist – they did not “disappear” and they are not in the process of “disappearing.” Several members of some of those tribes actually pointed this out in the comments. This idea, that Indigenous peoples would go extinct, comes to us from people like Edward Curtis, his contemporaries, and others before them who believed that in the face of white settlement, these communities would either assimilate or die off. This was the rationale behind horrific institutional practices such as reserve allocations, forced relocations, the residential school systems, and paternalistic social policies. Today, this racist ideology continues to inform mainstream culture’s assumptions about Indigenous people as primitive, backwards, and unsophisticated – in part because of posts like this one by Mr. Sanchez. A connected problem is that the context given for Curtis’ work is entirely laudatory. The post reads as quite a celebratory one, without pointing to the numerous foibles of Curtis’ project, “vanishing Indian” trope included. For instance, Curtis often posed his images to make Indigenous peoples look “primitive,” or he doctored images afterwards to emphasize this as well. Any gloss on Curtis’ career which does not take into account the problematic aspects of his work, commonly known and widely available in both popular and academic books, offers an incomplete, and thus inaccurate, reading of Curtis. No photography expert would explore these photographs today without considering this other context, so I cannot understand why Mr. Sanchez has chosen to do so. The history of colonialism in North America is complex, but this issue is one on which there is unanimous agreement. Curtis’ images are often used in interesting ways by Indigenous peoples today, some of whom are proud to see their ancestors represented in the photographs. Beyond that, many of the photographs are gorgeous. However, the legacy that Curtis left with the photos is not merely a positive one, and to treat them so simply is intellectually dishonest. What is especially dangerous about this is that Indigenous peoples across North America continue to experience oppression in their daily lives because of ideologies like this – even though these ideas are rooted in history, they still have destructive affects today. I am a fan of BuzzFeed, and one thing I have always appreciated is that you seem to make an effort to produce and share content which helps move society forward. This progressive zeitgeist is entirely at odds with the ideas shared in the Curtis piece, which repeats nineteenth-century racism. I sincerely hope that this email will get a response from you, so that there can be some action on the post. It doesn’t need to be deleted, but allowing it to stand as it is means both accepting and dispersing racist ideology to a very wide audience. I encourage you to carefully read the comments left on the article, especially those by Indigenous peoples, who explain in their own words why the post is unacceptable and inaccurate. Thank you for your time, and I hope to hear back from you on this matter.